***This kit has now been replaced by alternative products. The Docking Cradle (CR-10) supplied with the DS-5000 allows for the machine to recharge and download dictation to the PC as well as providing charge even when the PC is not in use. The docking cradle may also be used as connection point whilst using hands free dictation. 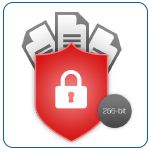 Thanks to PIN Protection and 256-bit DSS Pro real time Data Encryption, even the most sensitive files remain secure at all times. It fully supports your workflow also in conjunction with speech recognition software. Housed in a luxurious matte-black metal body that exudes elegance, it not only plays the part – it also looks the part. No matter how diverse the jobs you have, the DS-5500 can handle it. Up to seven folders with up to 199 files each are available to organize recordings. So that important parts can be easily found later on, users can set up to 32 index marks per file during recording. The DS-5500 is certified for maximum dictation accuracy by Dragon, maker of industry-leading NaturallySpeaking voice recognition software. The recorder and included ODMS Software are fully compatible with Dragon NaturallySpeaking, creating efficient voice recognition workflows. 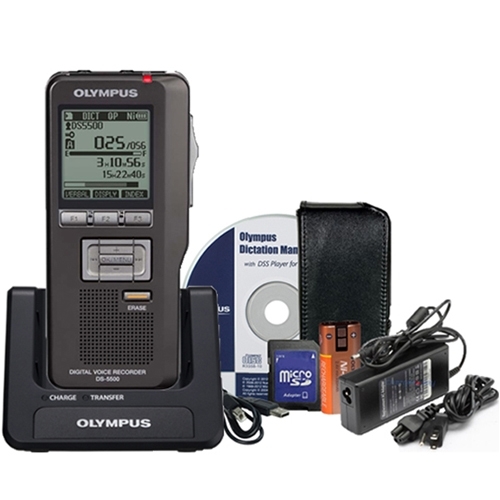 Moreover, the DS-5500 also features a full duplex microphone and speaker. Centralised firmware updates are also possible with this model. Ensuring the DS-5500 remains up-to-date even in years to come, a special I/O interface has been integrated, allowing plug-in modules of the future to be supported. 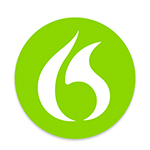 Furthermore, the included DSS Player Pro Dictation Software Module represents a powerful new dictation management tool. This will enable users to flexibly enhance their dictation workflow in a variety of IT environments – no matter how small or large. The software supports multiple file formats including DSS Pro, DSS, WMA and WAV. Moreover, MP3 decoder support is also provided. DSS Player Pro will even automatically update itself – ensuring users always have the most up-to-date solution available to optimise office efficiency. Furthermore, users can set up password protection on their device. 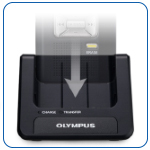 The special DS-5500iD model even enables protection using biometric information. In this way maximum security is assured. Simplicity in action While the DS-5500 is a veritable powerhouse, operation remains simple. Menu choices are intuitive to let the user focus on the business at hand. A single slide switch allows the most common functions to be accessed in just a fraction of a second. Further navigation buttons are located ergonomically in the centre of the device to ensure easy data input and access to settings. Allowing all information to be seen at a glance in a choice of six languages, this model also features a large, back-lit LCD, which is protected against scratches thanks to a high-grade, coated screen.